With pristine white sandy beaches surrounded by crystal clear turquoise waters, the Turks & Caicos have developed rapidly over the last twenty years. They are popular amongst destination club members and several clubs have homes there. The 8 islands and approximately 40 cays are easily accessible, being just 75 minutes from Miami and having direct flights from both Europe and the Americas. They cover a total of approximately 238 square miles of land and are surrounded by one of the largest coral reefs in the world, providing some spectacular diving and snorkeling. The deeper offshore waters often teem with humpback whales, eagle rays and turtles while the closer inshore reefs offer a myriad of brightly colored tropical fish. Over the winter, the entire Atlantic herd of humpback whales pass by the shores on their annual migration. Other colorful species on the islands are the host of celebrities who have homes there, including Bruce Willis, Oprah Winfrey, Michael Douglas, Donna Karan and Keith Richards. Many other celebrities have visited the islands on vacations. Amongst this archipelago, the most popular island is Providenciales, known as "Provo" to the locals. This is home to all the destination club residences. On the quieter southern side of Provo, next to Chalk Sound is Sapodilla Bay. Villa Pima is one of only about a dozen homes on this family friendly bay, and the private beach is just 50 yards from the villa. The spacious free standing home has four-bedrooms, its own fitness room and a private swimming dock. The boutique resort of The Somerset on Grace Bay is the location for the two Ultimate Escapes homes. The beachfront Signature club home is 2,472 sq.ft. in size, with 1,600 sq.ft. of terraces There are 3 bedrooms (plus 2 sleeper sofas), and 3 bathrooms. The 2,364 sq. ft. Premiere club home has 2 bedrooms, 2½ bathrooms and overlooks the gardens and regulation croquet lawn. The resort has a fitness center and steam room, plus two restaurants and a kids club. And provides complimentary hobie cats, kayaks and snorkeling gear. The club has three 2,600 sq. ft., condominium style residences at The Regent Palms on Grace Bay. Each one has either 3 or 4 bedrooms. The 12-acre lushly landscaped estate resort has 72 condominium residences, a 25,000-square-foot spa, two signature restaurants and a large infinity pool. Amenities include non-motorized water sports, tennis, croquet, a fitness center and children's club activities. The Equity Estates property is a 4 bedroom, 4.5 bath, beachfront condominium centrally located on the 6th floor lower penthouse of The Regent Grand on Grace Bay. This 4,546 sq. ft. unit has its own private elevator and a private spa serenity room with a six foot tall indoor copper mirrored waterfall. The 50 condominiums at the resort share a spa, fitness center and tennis. The 2,800 sq. ft. penthouse condominium has a further 1,800 sq ft. wrap-around terrace providing incredible ocean views. Located at Le Vele Resort on Grace Bay this 3 bedroom, 4 bathroom penthouse property is one of just 22 spacious units in this boutique resort. Quintess members can use the resorts fitness center, complimentary bicycles and are just steps away from the beach. Provo has a good choice of both casual and fine dining eateries. Prices tend to be higher than in the US, since much of the food has to be imported. Here's a few favorites for destination club members. Da Conch Shack very simply, eat conch and drink rum punch on Grace Bay beach. Hemingway's on the beach at the Sands Resort, Grace Bay. Casual place for breakfast, lunch or dinner with a Caribbean flavor. Anacoana offers great views and a cuisine with global influences at Grace Bay Club. There is a dress code and no children under 12 at Provo's only ocean front gourmet restaurant. Coyaba is an elegantly appointed restaurant offering contemporary Caribbean Cuisine. Just off Grace Bay Road and close to the Grace Bay Club. Coco Bistro provides wonderful French and Mediterranean cuisine. Serving dinner and jazz under the palms on Grace Bay Road. It's also currently the number one Provo restaurant on Tripadvisor. Besides relaxing at the pool or beach there are a wide variety of activities to make an exciting and fun vacation. Scuba and snorkeling are very popular on the pristine coral reefs surrounding the islands. Some of the reefs are just a few hundred yards off shore. Further out the drops go down to 7,000 ft providing spectacular wall dives with 200ft visibility. If you want to see the fish, but are not so keen on getting wet, the glass bottom boats and submarine are another way to view the tropical denizens that inhabit the reefs. Whale watching is spectacular during the annual migrations from January to April. There's a wide variety of sport fishing from close inshore bone fishing and fly fishing to deeper catches of marlin, tuna and wahoo. Local companies can provide boats, charters and all the gear. Other water sports and activities include wind surfing, kite boarding and sailing for everyone from beginners to experts. Relaxing day or evening cruises can take you all around the islands to visit hidden beaches and coves. Horse back riding is available on Provo and Grand Turk where you can canter along white sand and ride through turquoise waters. The Provo Golf Club has a 6,705 yard par 72 championship course including well manicured greens and lush landscaping. Multiple day spas offer massages, facials and lots of pampering and rejuvenation. A couple of Casinos offer blackjack, roulette, poker and slot machines and there are several night clubs and late night bars. American Airlines - Service from Boston, Miami and New York/JFK to Providenciales. British Airways	- Service from the UK (LHR) to Providenciales, with a stop in Nassau, Bahamas. US Airways - Service from Philadelphia, Boston, Washington DC, Pittsburgh, Raleigh and Richmond, VA through Charlotte, North Carolina. Delta Airlines - Service from Atlanta to Providenciales. 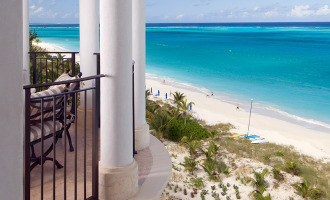 Air Canada - Service from Toronto and Montréal to Providenciales. Bahamas Air	- Service from Nassau to Providenciales. Charter flights are available from Toronto, Detroit, Boston, Miami, Philadelphia, Chicago and Fort Launderdale. Flying times are roughly 75 minutes from Miami, 3 hours from New York, less than 3 hours from Charlotte, North Carolina and 3-1/2 hours from Boston. To make life extra easy for visitors, the official currency is the US dollar and English is the official language (the Islands are a British Crown colony). The 350 days of sunshine a year, see the temperature average 83 degrees F (28C) with fairly small variations throughout the seasons and almost continuous ocean breezes from the trade winds. If you've stayed at any of the destination club homes do contact us with your stories, tips or advice.